First of all I want to say a big sorry to all my readers for not posting any recipes for a while. I’ve great news to share with you all. Now that I am past my morning sickness and big trip to India, I am happy to post one of my favorite recipe today. 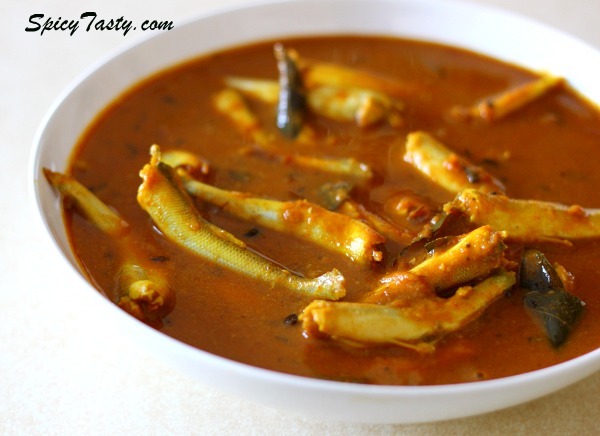 In my recent trip, my mom made this Nethili fish (anchovies) kuzhambhu and it tasted like heaven. 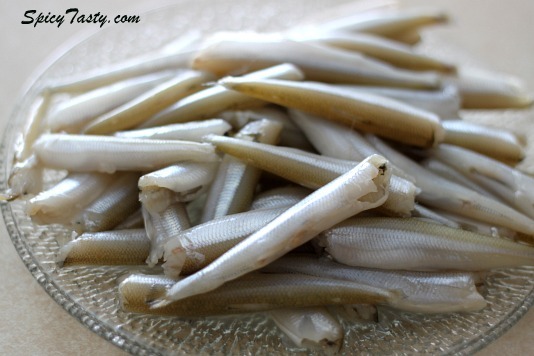 When I came back I found some fresh Anchovies in Oriental market. I was so happy and I made this curry out of it. 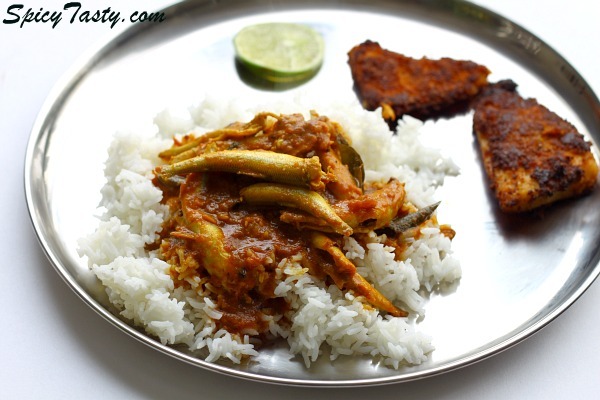 this fish kuzhambhu recipe is a little different from the last one I posted. Wash and clean the fish (cut the head and clean it). Dust them with a little salt and turmeric powder keep them aside. Now just microwave the tamarind with 1 cup of water for 30 seconds or soak them for an 5-10minutes. Mash it well and strain the tamarind water. Now add red chili powder, salt, coriander powder and turmeric powder into the tamarind water. Mix it all together. You can taste and adjust the sour and spicy consistency from the above mixture. Now grind the onion and garlic into coarse paste and keep them aside. Grind the tomatoes into smooth paste and keep them aside. Now take a wide pan add 2 tbsp of vegetable oil add vadagam (optional), fry them for a minute. After that add ground onion paste, curry leaves saute it very well. Once the raw smell goes off add the tomato paste and mix it all together. Let them sit in the heat for few minutes until the raw smell goes off. Taste the salt and adjust according to it. Add 2 tbsp of sesame oil and bring it to boil in medium heat till the oil floats on top. The gravy should taste little sour and spicy. Finally add the fish and just bring it to a boil only once and remove from heat. If you don’t use vadagam, substitute with some fresh garlic (2) and 1/2 tsp of fenugreek seeds. Curry looks delicious. Congrats on your little bundle of joy. Take care enjoy each bit of days you will not get after he or she makes entrance. Slurp, mouthwatering here..Happy and congrats..Take care of u..
OMG what a mouthwatering clicks….. my favorite one dear…. I tried this today did not have vadagam but it came out very nice. Thank You for the recepie. Oh my god!! This looks amazing!! Will surely give it a try.